The day of strike, the 7th of April (2016), also had this poster with a list of requests. THE EPO‘s management lies. It lies a lot. It kept telling the media that only a disgruntled minority was complaining and that there were no strikes (saying nothing about a lot of protests in 2015). Battistelli is an emperor of lies, the Liar in Chief as we often call him, and his staff generally knows this. Almost every sentence that comes out of his mouth these days contains at least one lie. 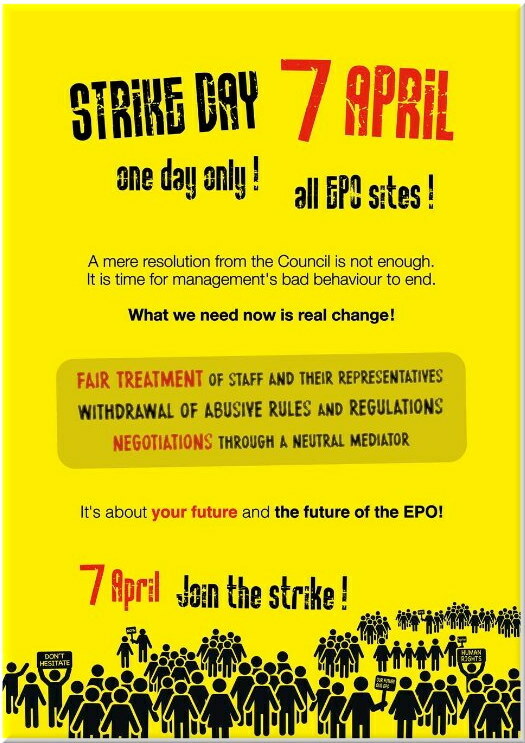 As we write this, the final numbers for the strike on 7 April are not yet known, but it seems possible that it was the biggest ever strike in the history of the EPO. This is an amazing result and it shows what is possible when colleagues committed to the future of our office work together. Our goal, as initiators of the strike, was to counter the President’s claim that only “a small minority of staff” were against him and his “reforms”. Thanks to you, we achieved that goal resoundingly. Today, there can be no doubt that across the entire EPO, people are profoundly angry about what is happening. On 7 April 2016, staff of the EPO said unmistakably that they will never accept injustice against colleagues, or abusive rules and regulations. We are sure the Administrative Council was listening. The ball is now in their court. Our thanks go to each and every staff member who went on strike! Ms Bergot announced in her publication to staff dated 8 March 2016 the result of the strike ballot organised by the Office: Staff has voted in favour of a strike. Following this decision to start a strike, we inform you of the following. • the initiation of open and fair negotiations between management and staff representatives, led by an internationally recognised mediator/conciliator. The initiators of the call for strike have informed us that they would like the strike to happen at the earliest opportunity. Accordingly, the strike shall take place on 7 April 2016 at all sites of employment: Munich, The Hague, Berlin and Vienna. Please be assured that the Central Staff Committee has always been prepared to enter a fair social dialogue and continues to be so. The CSC recognises the recent resolution of the AC as a positive signal and a step into the right direction. If social dialogue in the time before the strike day leads to a substantial progress on the grounds for strike, we are willing to recommend to Staff to cancel the strike action. We confirm that this letter was legitimately decided and produced by the Central Staff Committee 1. Suffice to say, as Battistelli has done not a single thing to improve things, all those who went on strike probably continue to distrust Battistelli and disapprove his regime. A lot of those who did not go on strike probably just feared retribution, as we explained at the time (there was no opportunity for anonymity for those who participated in the strike).